I'm back to the blog. Why is this always such a long road for me? I spend my days thinking in prose with plans to write the definitive treatise on grief or saying good bye to my baby on her first day of school, but instead of writing I circle the computer, surfing Facebook, writing clever emails, and yelling at the Internet, feeling so uneasy that I won't even open my blog to have a look at what I last wrote about. A reminder of what I hadn't done. And here I am - finally - with more meta about writing. Or not writing. Maybe a treatise on writing about not writing is my niche. But let's have a go at the other stuff anyway. I last wrote in May about the crazy my house was under. The summer in contrast, was calm and happy, laced together by my divine daughters dodging sprinklers, dock fishing and wave jumping. The summer between baby and big girl. Those beach towel cuddles growing ever less common. And then summer ended the way it does, with the first day of school. 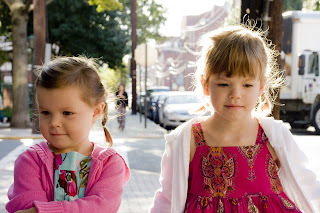 Up early, the girls put on their special first-day-of- school dresses and I braided their hair. We went outside for pictures; Mimi with her worried smile. And off we went. And a little bit of my heart stayed behind. When I pick up Violet at school, she races into my arms and presses her cheek to mine, still fully surprised and thrilled to see me. It is the high point of my day. It is a primordial hug. It feels like the reason I was born. That's a lot for a 30 second hug, but this is my baby and she isn't home with me anymore and that makes me cry a little some days. She is so shy and I worried so much, but she's happy in school. She shares the stories of her day with such brightness and joy, sending my gut flip flopping with melancholy and satisfaction. When I pick up Mimi at school, she flops her backpack and lunch at my feet, starts explaining why she didn't eat and can she go to the park and she's hungry and thirsty and hot and cold. Before all of this, I peek at her and see that serious face. So inside her own head. There are few running, leaping hugs from this one. It's the age maybe or the kid. She sat on my lap on the train recently and it occurred to me how rarely I get to hold her anymore. I also had a flash of missing Mimi the baby, the one that wasn't so complicated. The one that didn't need to clean up her own mess or figure out how to read and pronounce the, when th comes out zuh. The one that didn't get the impatient end of my patience. This one sings school songs with her sister though and admits mistakes to her friends, inviting them to play after previously excluding them. She has held on to our secret mission to get frozen yogurt with a precious persistence, and she made a bookmark for a new friend, telling her she could change out the stickers or color it a different color if she wanted to. She's magic and mayhem. I'm holding on and they are scrambling down my legs to go play. I push them out the door and they cry to stay home. Holding on and letting go. Regina Spektor, rad singer, philosopher and writing muse, sings a deceptively peppy song about taking the best of what you are, loving it and then putting it into someone else's heart, and then doing it again and again. We listen to Regina while I cook dinner, which is a happy time of day for me, and as is often the condition with parenting, I don't think of Adam when I hear these lyrics (he who has so gracefully carried the best and the worst of me in his heart for 13 years), I think of Mimi and Violet. I am home alone now. I am here to get a life of my own now. But their faces are always in front of me. I have tucked myself into their bursting hearts and now I wait.